The city of Budaörs (German: Wudersch) with its 30.000 inhabitants is located on the western border of Budapest. After the Ottoman wars, the city was almost depopulated in the late 17th century. The Zichy family recruited German settlers for the region and viticulture turned the settlement into a wealthy hamlet. However, wine growing found a sudden end in the 1880 due to a plague of vine fretters. In 1730, the settlers began construction on a Roman-Catholic church which they dedicated to Saint John of Nepomuk. Their most important religious holiday was the Feast of Corpus Christi. 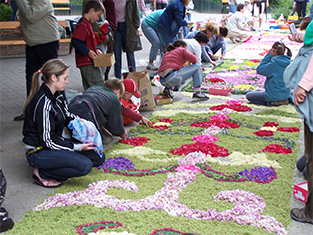 The congregation created an ornamented carpet of flowers alongside the two-kilometre long precession path. After World War I, Budaörs became known for its peach plantations. The peach farmers brought their fruit into the capital by tram or on feather carriages and sold them there. The peaches were delivered to Vienna and were even flown to Berlin and London. After the resettlement of the German population, peach and wine growing became less frequent. After World War II, the Germans of Budaörs were displaces. On January 19th 1946, the first trains brought the displaced people to Mannheim in Baden-Württemberg. Six transports were to follow. In August 1947, 80 more families were deported to Hoyerswerda. Budaörs lost almost 90 percent of their inhabitants. Budaörs holds the oldest remaining cemetery of Germans of Hungary. The cemetery was used from 1755 onwards and the oldest remaining tombstone is that of priest Josef Mertinger who died in 1782. The cemetery holds almost 1.400 tombstones and displays the unique style of stonemasons of the region. The last funeral was held in 1956. In June 1996, the local administration of Germans of Hungary declared the cemetery a local monument for the displacement of Germans of Hungary. In 2006, a memorial was erected on occasion of the 60th anniversary of displacement. Stone Mountain Chapel is one of Budaörs main sights. It was built by Franz Wendler to whom Virgin Mary had appeared in a dream. He supposedly dreamt of a dog rose on Stone Mountain, every flower of which bore the face of Mary. On the petals he read: “I am the Immaculate Conception”. In spring 1855, he started construction. On October 15th 1855, the chapel was consecrated to Mary’s Immaculate Conception. Franz Wendler lived in a cave next to the chapel from 1878 until his death. 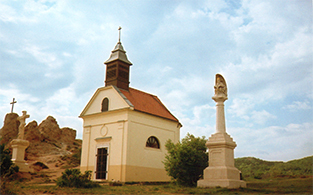 The chapel is one of the most important pilgrimage places for Germans of Hungary in the area of Buda. The chapel was destroyed after 1946. The statue of Mary could be saved and came back to Budaörs in 1997. In 2003, private donors financed the reconstruction of the chapel. Silvester Herczog is one of Budaör’s famous sons. The composer and musician was born in Budaörs in 1893. After World War II he conducted the “Herczog Brass Band”. After his displacement he moved to Neckarelz where he was the conductor of Bodaör’s Heritage Band. The local heritage museum of Budaörs is worth visiting. It is located in an old weaver’s house and displays a traditional parlour which reflects the deep religious ties of the inhabitants. It contains religious paintings, holy water and prayer books. Furthermore, a church from the 40s can be seen was well as traditional costume for everyday life and festive holidays. The collection of local history holds many documents and images on the settlement’s history from the 1720 until today. Every three years, Budaörs’ inhabitants stage a passion play with Hungarian and German text. 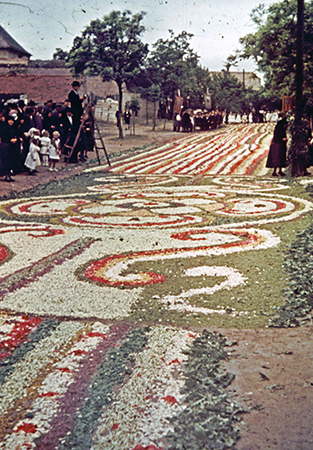 Flower carpet of olden days. The carpets are still prepared carefully today. Stone Mountain Chapel on an old postcard.